Ashampoo Burning Studio 2009 is the upgrade version of Ashampoo Burning Studio 2008, where both is free CD and DVD burning or writing software from Ashampoo. Ashampoo Burning Studio 2009 is the free version of Ashampoo Burning Studio 8 which requires commercial license. 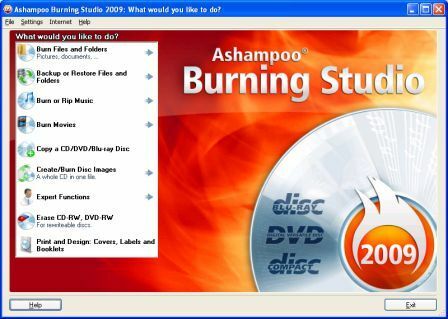 Ashampoo Burning Studio 2009 can be used as a free alternative to popular Nero burning software. Ashampoo Burning Studio 2009 suite provides simple and powerful functions such as creating a simple data disc in the form of CD, DVD or Blu-ray, creating audio, vidoe or Super Video CD, design disc covers, labels or booklets, copy discs, erase rewriteable discs, rip audio CDs, backup tool and ability to works with several typesof disc images (ISO, CUE/BIN, ASHDISC), without bloat, unnecessary features, and confusing options, via an easy-to-use wizard-based interface. To get the free serial code for Ashampoo Burning Studio 2009, just select Get full version key (Recommended, remove shareware restrictions!) 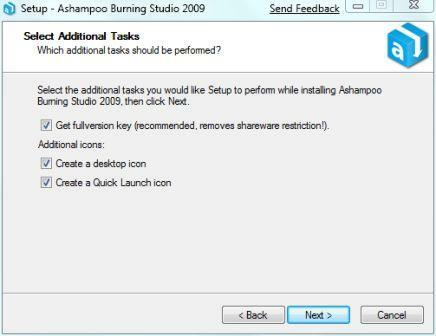 check box during installation in order to launch the Ashampoo Burning Studio 2009 free license key code registration page upon completion of installation. Enter the email address and submit, and emails with registration key for Ashampoo Burning Studio 2009 will be received. Enter the key when running Ashampoo Burning Studio 2009 to convert the trial version into full version product, which can also be called from Help -> Register. Note that while Ashampoo Burning Studio 2009 is similar to Ashampoo Burning Studio 8, it lacks features such as create animated DVD slideshows from photos, ability to create DVD movies from QuickTime source files (amongst many other supported formats), preview them with sound, then burn them to video DVDs in the later full featured version.